Bone morphogenetic proteins (BMPs) participate in organ regeneration through autocrine and paracrine actions, but the existence and effects of these proteins in the systemic circulation is unknown. Using liquid chromatography–mass spectrometry, we identified BMP6, GDF15, and the BMP1–3 isoform of the Bmp1 gene in plasma samples from healthy volunteers and patients with CKD. We isolated the endogenous BMP1–3 protein and demonstrated that it circulates as an active enzyme, evidenced by its ability to cleave dentin matrix protein-1 in vitro. In rats with CKD, administration of recombinant BMP1–3 increased renal fibrosis and reduced survival. In contrast, administration of a BMP1–3-neutralizing antibody reduced renal fibrosis, preserved renal function, and increased survival. In addition, treating with the neutralizing antibody was associated with low plasma levels of TGFβ1 and connective tissue growth factor. In HEK293 cells and remnant kidneys, BMP1–3 increased the transcription of collagen type I, TGFβ1, β-catenin, and BMP7 via a BMP- and Wnt-independent mechanism that involved signaling through an integrin β1 subunit. The profibrotic effect of BMP1–3 may, in part, be a result of the accompanied decrease in decorin (DCN) expression. Taken together, inhibition of circulating BMP1–3 reduces renal fibrosis, suggesting that this pathway may be a therapeutic target for CKD. Natural bone morphogenetic protein (BMP) complexes in organs and biologic fluids have not been characterized. It has been presumed, based on their initial characterization, that BMPs are primarily present in bone. Their paracrine, autocrine, or endocrine mechanisms are not currently well understood. To date, the presence of BMP family members in the systemic circulation has not been shown. This could be predominantly due to the low concentrations of BMPs and difficulties in isolating them from complex biologic samples. However, it is equally possible that BMPs function only in an autocrine or paracrine manner and hence are not present in the systemic circulation. On the basis of previous studies, we know that kidney cells express BMP7 after renal failure,1–3 whereas hepatocytes express BMP9 in regenerating liver.4 On the basis of these data, we hypothesized that BMPs under conditions of tissue repair/regeneration would get released into systemic circulation and would serve as specific biomarkers of the disease process. To test this hypothesis, we utilized purified plasma samples from healthy volunteers and patients with chronic kidney disease (CKD). On the basis of utilization of liquid chromatography–mass spectrometry (LC-MS), we identified BMP6,5 growth differentiation factor (GDF) 15,6 and the BMP1–3 isoform of the Bmp1 gene in these plasma samples. In this manuscript we further explore the role of the circulating BMP1–3. Although originally isolated from bone with other BMPs because of its affinity for heparin, BMP1 is not an authentic member of the BMP protein family and instead belongs to the astacin/BMP1/tolloid (TLD)-like family of zinc metalloproteinases, which are fundamental in the development and formation of the extracellular matrix (ECM).7–10 The Bmp1 gene also encodes a second, longer proteinase by alternatively spliced mRNA that is designated mammalian Tolloid (mTld) or BMP1–3.11,12 TLD-like proteinases also have roles in activating TGF-β (TGFβ) superfamily members myostatin/GDF-8, GDF-11, and TGFβ1.10,13,14 A BMP1 knockout mouse dies soon after birth from failure of ventral body wall closure due to abnormal collagen fibrillogenesis.13 Because BMP1 is known to cleave proteins of the ECM,9 we assumed that systemically available BMP1–3 might have a role in diseases such as CKD, which develops at some level organ fibrosis characterized by an excessive accumulation of ECM leading to the loss of renal parenchyma. The molecular mechanism of renal fibrosis is considered to be mainly determined by the expression level of TGFβ1. Developing novel treatment strategies to prevent the progression of CKD and support kidney regeneration is an unmet medical need. Here we show that circulating BMP1–3 in CKD has an important role in kidney function, providing a novel molecule involved in renal pathophysiology and a potential therapeutic target for regenerative medicine. LC-MS analyses of all protein bands from purified plasma samples revealed that the BMP1–3 (alternatively spliced long isoform of the Bmp1 gene) circulates in the blood of healthy individuals and in patients with CKD (Figure 1). The circulating human BMP1–3 was characterized by eight specific peptides from the BMP1–3 mature domain (Figure 1, A and B). Six peptides were from the protease CUB I and CUB II domains, common to all BMP1 isoforms, and two peptides were from the CUB IV domain, which is specific to BMP1–3. The expected molecular weight of the full-length BMP1–3 protein was 111 kDa and that of BMP1–3 without the prodomain (16 kDa) was 95 kDa, which corresponded to the molecular weight of the endogenous BMP1–3 detected by Western blot analysis. BMP1–3 eluted from SDS gels and incubated with furin, an SPC enzyme that processes the proBMP1 at the RSRR site (120 amino acids)15 into its active form, confirmed that the native BMP1–3 did not contain the prodomain (Figure 1C). Using a specific mature BMP1–3 antibody and an antibody against the BMP1 prodomain, immunoblotting analyses confirmed the presence of the mature BMP1–3 at an approximate molecular weight of 95 kD, whereas the prodomain was not detected (Figure 1D). The role of the prodomain of BMP1/TLD-like proteinases appears to be in maintaining the BMP1/TLD-like proteinases in the latent form.7 Our results indicate that the circulating BMP1–3 is the active enzyme form. This was further demonstrated in experiments in which BMP1–3 isolated from the plasma of healthy individuals and patients with CKD processed dentin matrix protein (DMP)-1 in vitro (Figure 1E). Identification and characterization of BMP1–3 in the human plasma. (A) Domain structure of BMP1–1 and BMP1–3 (asterisk indicates identified peptides from BMP1–3). (B) Identification of BMP1–3 in the plasma of healthy individuals by LC-MS. Probability-based Mascot scores are given for each peptide. Individual ions scores >30 indicate identity or extensive homology (P < 0.05). All spectra were manually validated. (C) Plasma of healthy individuals (80 ml) was purified by heparin affinity chromatography. Lane 1: fraction eluted by 1 M NaCl. Lane 2: molecular weight marker. Lanes 3 and 4: BMP1–3 eluted from Coomassie-brilliant-blue-stained gel band incubated without furin (lane 3) and with furin (lane 4). Blots were visualized with a specific BMP1–3 antibody. (D) Plasma of healthy individuals (80 ml) was purified by heparin affinity chromatography. Eluted 1-M NaCl fraction was incubated with BMP1–3 antibody (lane 1) and with an antibody against the BMP1 prodomain (lane 4), molecular weight marker (lane 3), and negative control (lane 2). Arrow indicates the connection of two different Western blots incubated with two different antibodies. 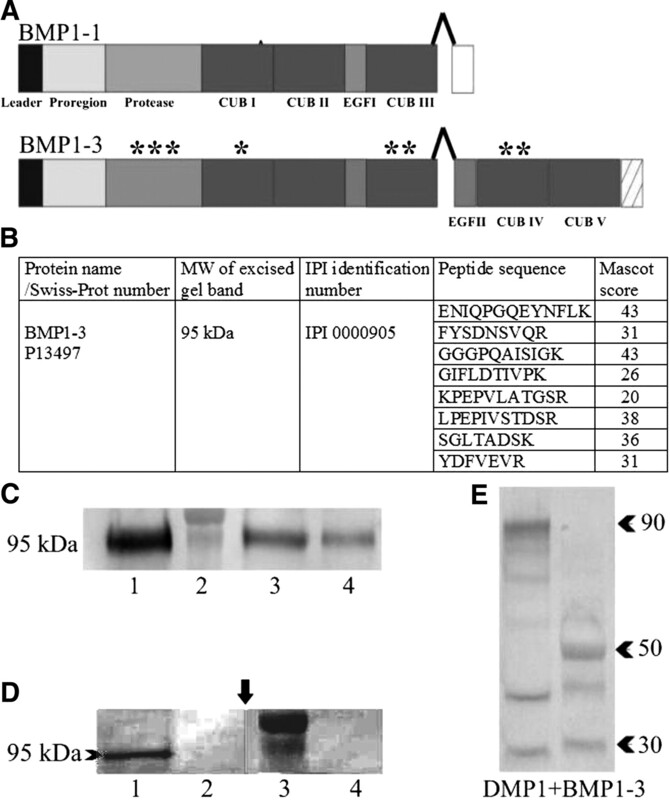 (E) Western blot analysis after cleavage of DMP1 with endogenous human BMP1–3 before (lane 1) and after overnight incubation at 37°C with BMP1–3 (lane 2). In human development, BMP1–3 was present in the limb (data not shown), kidney, and liver (Figure 2). BMP1–3, but not BMP1–1, was present in hepatocytes of the developing liver at 10 to 14 weeks of gestation (Figure 2A through 2C). In the kidney, at 10 weeks of gestation, BMP1–3 and BMP1–1 were intensively stained in the tubules of the mesonephros (Figure 2D through 2F). Immunolocalization of BMP1–1 and BMP1–3 in the liver and kidney during human development. In the liver at 7 weeks of gestation (frame; A) BMP1–1 was not present (B), whereas hepatocytes stained positively for BMP1–3 (C). At 7.5 weeks of gestation (E) BMP1–1 and (F) BMP1–3 were expressed in more mature tubules inside of the kidney (t; asterisk), but no labeling was found in the glomerulus (g) (frame; D). A and D magnification: ×1.5; B, C, E, and F magnification: ×40. To test the relevance of BMP1–3 in regulating kidney function, we utilized a preclinical rat model of CKD caused by removing five sixths of the total kidney mass. In control rats, serum creatinine progressively increased, indicating a rapid loss of kidney function (Figure 3A). Systemic administration of 5 μg of recombinant human BMP1–3 (rhBMP1–3) protein additionally worsened the kidney function, and by week 15 there were no surviving rats in this therapeutic group (Figure 3B). On the contrary, serum creatinine was reduced in subtotal nephrectomized rats treated with the BMP1–3 antibody, and the overall survival rate of 60% indicated the benefit of therapy (Figure 3, A and B). The urinary total protein to creatinine ratio was significantly reduced as compared with the vehicle-treated rats for all doses at the biweekly intervals up to 12 weeks (data not shown). Treatment of CKD rats with a BMP1–3 antibody (A) decreases serum creatinine and (B) prolongs the survival rate. Subtotally nephrectomized rats were randomly assigned into groups of 12 to 14 animals treated as follows: CKD control treated with vehicle (□; 30 mM HEPES buffer pH 7), BMP1–3 antibody (▵ 1 μg/kg; ♢ 5 μg/kg; ○ 15 μg/kg), and BMP1–3 (● 5 μg/kg). Data are shown as mean ± SEM. *P < 0.05 versus CKD control; #P < 0.01 versus CKD control. 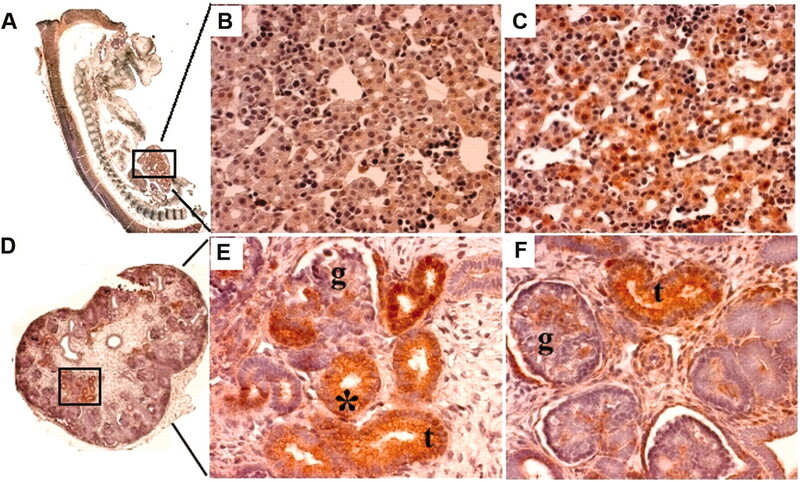 Histomorphometric analyses of kidney sections stained with sirius red indicated a delayed progression of the renal fibrosis and a better preservation of tubulointerstitial and glomerular structures in rats treated with the BMP1–3 antibody at the end of the experiment (Figure 4A through 4C). Increased BMP7 staining in the interstitium was found in BMP1–3 antibody-treated rats, reflecting a maintained regenerative process of kidney nephrons (Figure 4D through 4F). Increased BMP1–3 staining was detected by immunohistochemistry in kidney remnants of CKD rats (Figure 4, G and H). At week 13, approximately 42% of control and 57% of BMP1–3-treated kidneys were fibrotic (Figure 4 table). In contrast, only approximately 29% of the kidney area in rats treated with the BMP1–3 antibody was fibrotic (Figure 4 table). As an independent readout of fibrosis, we measured the amount of hydroxyproline, which reflects the total amount of mature, fully processed collagen deposited into tissue fibrils. In control and in BMP1–3-treated rats, 20 and 38 μg of hydroxyproline, respectively, was present per mg of dry weight of the kidney (Figure 4 table). In the BMP1–3 antibody-treated rats, only 9 μg of hydroxyproline per mg of dry weight remnant kidney was detected. As opposed to BMP1–3 therapy, reduced fibrosis in the BMP1–3 antibody-treated rats resulted in an increased number of viable glomeruli, less tubular atrophy, and an overall significantly increased survival rate (Figures 3 and 4). In the same rats with CKD treated with the BMP1–3 antibody, the plasma concentration of TGFβ1 and connective tissue growth factor (CTGF) decreased by >50% after 4 and 8 weeks, respectively, as compared with CKD control rats, whereas plasma levels of both growth factors were increased in rats treated with the BMP1–3 protein (Figure 5, A and B). Treatment of CKD rats with a BMP1–3 antibody decreases renal fibrosis and preserves kidney structures. (A) vehicle, (B) BMP1–3 protein, and (C) BMP1–3 antibody stained with sirius red for collagen. Immunolocalization of BMP7 in kidneys of CKD rats treated with (D) vehicle, (E) BMP1–3 protein, and (F) BMP1–3 antibody. Immunolocalization of BMP1–3 in (G) normal and (H) CKD tissue. 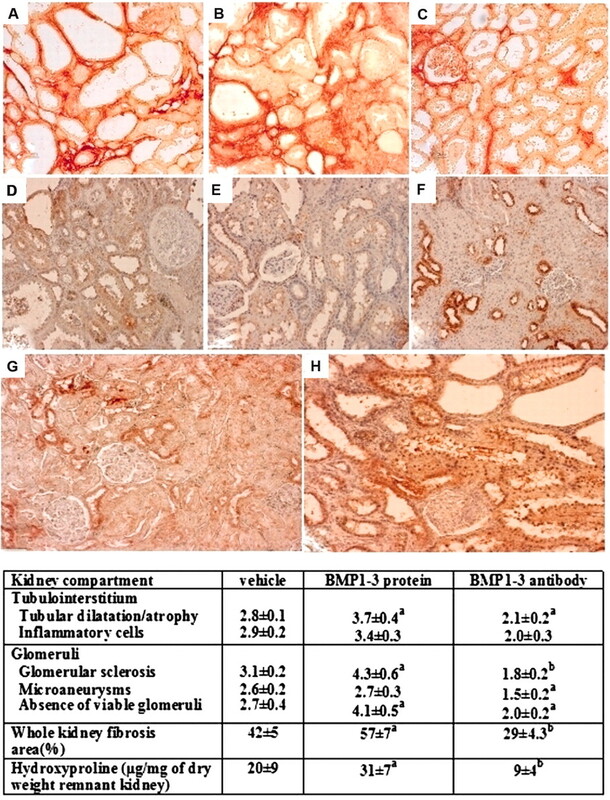 Table presents the morphometric analyses of kidneys from CKD rats treated with a vehicle, BMP1–3 protein, and BMP1–3 antibody. Morphologic lesions were graded using a semiquantitative scale from 0 to 4 as described.16 Fibrosis area (%) was quantified on sirius-red-stained sections using the Sform software. Two independent observers analyzed kidneys of 12 animals per treatment group. The results are presented as mean ± SEM. aP < 0.05; bP < 0.005 versus CKD control rats. TGFβ1 and CTGF plasma values in rats with CKD are decreased after therapy with a BMP1–3 antibody. 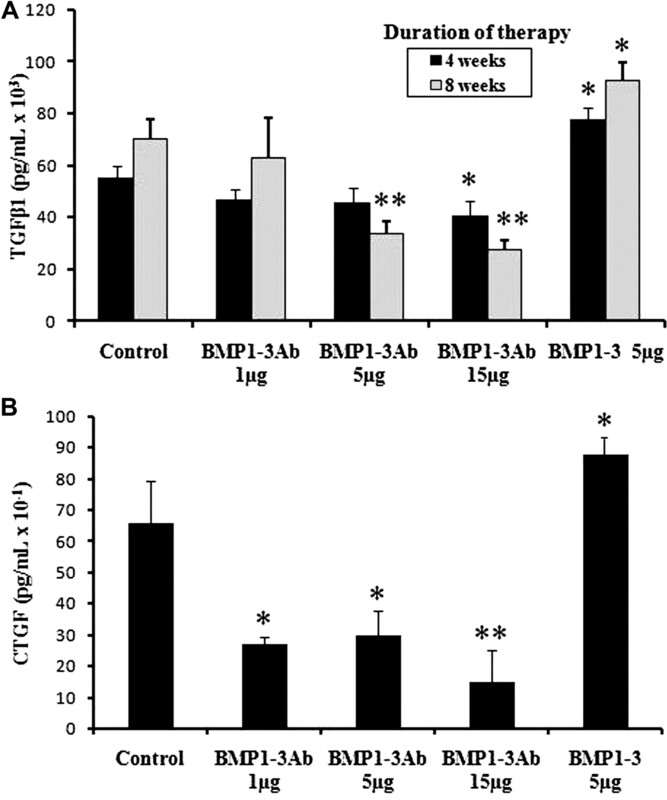 (A) TGFβ1 and (B) CTGF values in the plasma of rats treated with the BMP1–3 antibody (1, 5, and 15 μg/kg) and BMP1–3 protein (5 μg/kg) were measured by ELISA. *P < 0.05; **P < 0.001 versus control. After termination of the experiment, all organs were fixed and processed for histopathological examination as described previously.16 Autopsy did not reveal any treatment-related gross pathology. Organ weights were normal. Histopathological findings of heart, lung, liver, spleen, kidney, uterus, pancreas, esophagus, stomach, intestine, lymph nodes, bladder, brain, eyes, aorta, trachea, skeletal muscle, bone marrow (sternum), and femur were normal. Throughout the treatment period, rats receiving the BMP1–3 antibody did not have any signs of systemic and/or local inflammation or the appearance of tumors (data not shown). Administration of the rabbit antibody against BMP1–3 to rats with CKD for a period of 18 weeks did not result in the development of anti-rabbit IgG immunity (data not shown). We measured the concentration of circulating BMP1–3 by ELISA. Plasma levels of BMP1–3 in patients with CKD were higher than those in healthy volunteers (Table 1). In rats with CKD, plasma levels of circulating BMP1–3 were significantly higher as compared with control rats. Therapy with the BMP1–3 antibody reduced the concentration of circulating BMP1–3 in CKD rats in a dose-dependent manner (Table 1). BMP1–3 had no effect on Wnt signaling in U2OS cells transfected with the TCF-luciferase reporter (Figure 6A). In the same assay, the recombinant human Wnt3a protein promoted the translocation of β-catenin to the nucleus, whereas the effect of Dickkopf-related protein 1 was inhibitory (Figure 6A). However, BMP1–3 increased the β-catenin mRNA expression in HEK293 cells, which was inhibited by an antibody against the integrin β1 subunit but not against the integrin β2 (data not shown) and β7 subunits (Figure 6B). In HEK293 cells at 72 hours after BMP1–3 administration, the expression of type I collagen was increased. This effect was inhibited by an antibody against BMP1–3 and an integrin β1 subunit antibody (Figure 6C). The expression of the Tgfβ1 was increased in HEK293 cells treated with BMP1–3 (Figure 6D). In the same cells, BMP1–3 decreased the expression of Bmp6 and Bmp7 and significantly upregulated Bmp4 transcripts (Figure 6E). However, BMP1–3 was ineffective when added to C2C12 cells stably transfected with the BMP response element (BRE) from the Id-1 gene promoter fused to a luciferase reporter gene (Figure 6F). These experiments suggested that BMP1–3 acts via a BMP- and Wnt-independent mechanism involving integrin β1 subunit signaling. Interestingly, BMP1–3 decreased expression of DCN in HEK293 cells and remnant kidney samples from CKD rats (Figure 7, A and B). However, inhibition of BMP1–3 for 72 hours in HEK293 cells increased the DCN expression twofold, whereas an antibody against the integrin β1 subunit prevented the BMP1–3 activity, suggesting a complex regulation of DCN transcription by BMP1–3. In addition, the effect of BMP1–3 after 72 hours of therapy resulted in an increased expression of p21 and caspase-9 (Figure 7, D and E), which was inhibited by BMP1–3 and integrin β1 antibodies. Integrin-linked kinase (ILK) transcription was decreased tenfold in HEK293 cells treated with the BMP1–3 antibody (Figure 7C). Surprisingly, BMP1–3 inhibition increased the expression of Bmp7, which might have an additional effect on the kidney regeneration and suppression of Tgfβ1, as has been previously demonstrated.17 BMP1–3 inhibition did not change the Bmp1–3 gene expression (Figure 7F). Measurement of Wnt activity using U2OS TOPFlash cells in the luciferase expression system and quantification using luciferase reagent (Promega). (A) Real-time quantitative RT-PCR analysis of genes expressed in HEK293 cells after 72 hours treated in quadruplicate with BMP1–3 (150 ng/ml), BMP1–3 antibody (1 μg/ml), a combination of BMP1–3 (150 ng/ml) and β1 integrin subunit antibody (4 μg/ml), and a combination of BMP1–3 (150 ng/ml) and β7 integrin subunit antibody (4 μg/ml). For a negative control, cells were cultured only in the medium. Genes analyzed include (B) β-catenin; (C) collagen, type I (Col1a1); and (D) TGF-β1 (Tgfβ1). (E) Relative Bmp gene expression in HEK293 cells 72 hours after treatment with 150 ng of BMP1–3 protein. 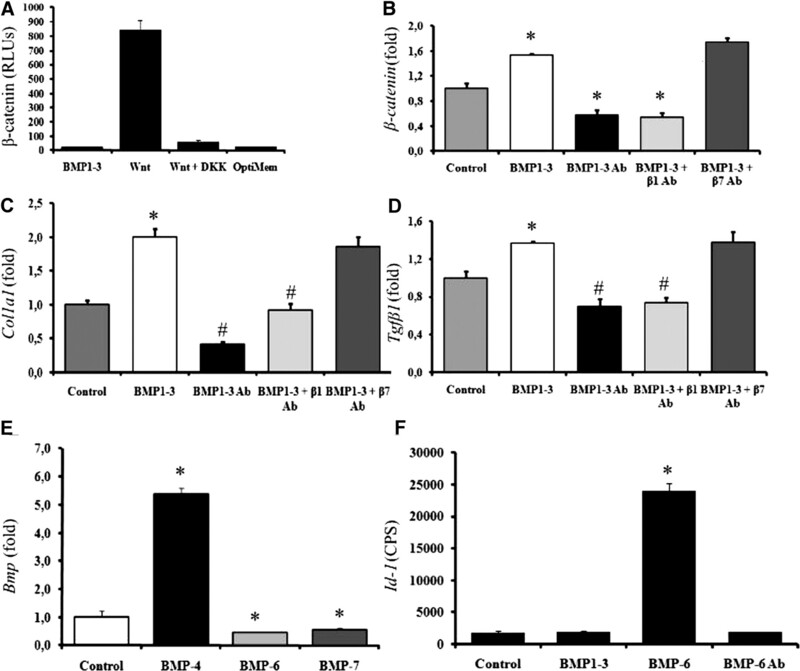 (F) Effect of BMP1–3- and BMP6-mediated Id-1 promoter activation. C2C12 cells stably transfected with BRE-Luc promoter were serum starved for 7 hours and treated with BMP6 (5 ng/ml), BMP1–3 alone (1000 ng/ml), and a BMP6 antibody (Ab) (1 μg/ml) for 17 hours. For a negative control, cells were cultured only in the medium (n = 6). Representative data from one of three separate experiments are shown. *P < 0.05 versus control; #P < 0.05 versus BMP1–3 and BMP1–3 + β7Ab (ANOVA; Dunnett test) in B, C, and D. *P < 0.05 versus control in E and F.
RT-PCR gene analyses in HEK293 cells. 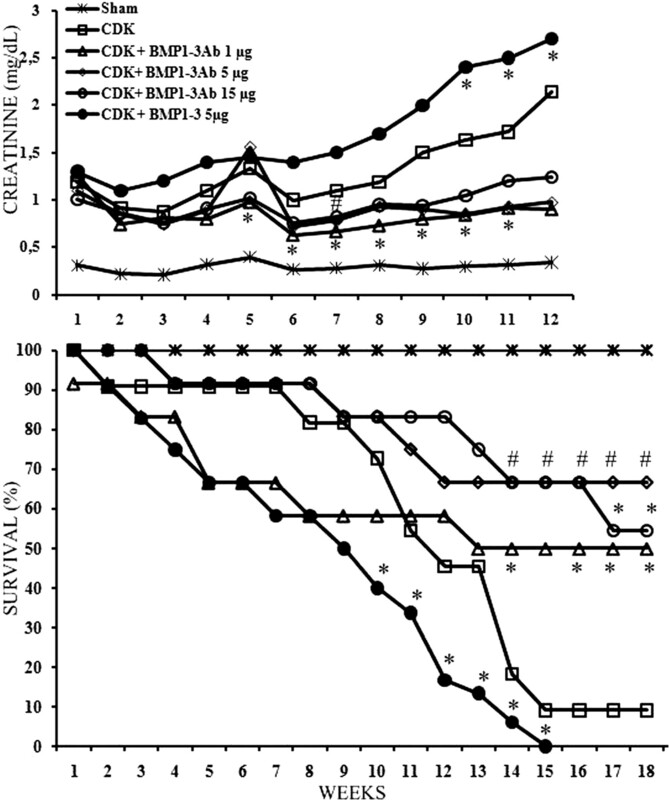 Cells treated for 72 hours in quadruplicate with BMP1–3 (150 ng/ml), BMP1–3 antibody (1 μg/ml), a combination of BMP1–3 (150 ng/ml) and β1 integrin subunit antibody (4 μg/ml), and a combination of BMP1–3 (150 ng/ml) and β7 integrin subunit antibody (4 μg/ml). For a negative control, cells were only cultured in the medium. Genes analyzed include (A) DCN, (C) Ilk, (D) cyclin-dependent kinase inhibitor 1 (p21), (E) caspase 9, and (F) Bmp1–3. (B) DCN expression in the remnant kidney tissue. *P < 0.05 versus control. Here we show for the first time that BMP1–3, the long form of the alternatively spliced Bmp1 gene, circulates in the human and rat plasma at a physiologically relevant concentration. Several potential Bmp1 alternatively spliced gene transcripts have been previously described but have not been confirmed on the protein level.9,18 Circulating human BMP1–3 isoform does not contain the prodomain and is active, which was confirmed by in vitro processing of the DMP-1. It has been previously demonstrated that the prodomain of BMP1/TLD-like proteinases must be proteolitically removed to achieve full activity.19 Our data indicate that the circulating active protein then plays a role in the regulation of ECM expression and deposition, which may lead to fibrosis in a disease state. To test this concept, we examined the role of BMP1–3 in an animal model of CKD. Our observations that BMP1–3 was not effective in U20S cells transfected with a TCF-luciferase reporter measuring β-catenin translocation into the nucleus excluded its direct effect via the Wnt receptor signaling pathway. However, β-catenin mRNA expression was increased after addition of BMP1–3 to the medium of HEK293 cells, which was specifically downregulated by an integrin β1 subunit antibody. Similarly, the increased expression of collagen type I and TGFβ1 mRNA by BMP1–3 was also mediated via the integrin β1 subunit. Recently, it has been demonstrated in mice with conditional knockout of β1 integrin that the expression of β1 integrin by fibroblasts is required for fibrogenesis40 and that interstitial renal fibroblasts are major producers of interstitial ECM.41 Integrin signaling activates many pathways, many of which induce cytoskeletal alterations and several downstream signaling events that can ultimately alter cell proliferation and differentiation.42 The precise mechanism of β1 integrin and BMP1–3 interaction needs to be further explored. These results indicate that the rational design of antifibrotic drugs for preventing progression of CKD should be directed toward inhibition of circulating BMP1–3, which might become a novel therapeutic target in regenerative medicine. Human blood samples were collected at the Clinical Hospital Dubrava in Zagreb, Croatia after approvals by the institutional ethics committees and informed donor consents were obtained. The samples were selected by I.G. and K.G. All patients' medical records are stored and available in the hospital. Healthy donors (five men and five women; 20 to 65 years of age) and CKD patients (seven men and three women, 43 to 68 years of age) were selected after testing to exclude HIV, hepatitis B virus, hepatitis C virus, or syphilis. The donors were required to fast and avoid taking medicines and drinking alcohol for 12 hours before the sampling. Human blood samples were obtained by venipuncture from each donor and patient into evacuated blood collection tubes containing the appropriate volume of anticoagulant (3.8% sodium citrate to form the anticoagulant:blood ratio (vol/vol) of 1:9). The specimens were centrifuged at 2600 × g for 15 minutes at 4°C. Plasma was purified by heparin affinity chromatography as described.50 Bound proteins were eluted and precipitated with saturated ammonium sulfate to a final concentration of 35%. The samples were kept on ice for 10 minutes and centrifuged for 5 minutes at 12,000 × g. The supernatant was discarded and the pellet was subjected to SDS-PAGE and Western blot analysis as described.51,52 The bands of interest were excised, digested with trypsin, and analyzed by LC-MS.
An Agilent 1100 nanoflow HPLC system (Agilent Technologies) was coupled to an linear trap quadrupole–Fourier transform mass spectrometer (Thermo Scientific) using a nanoelectrospray LC-MS interface (Proxeon Biosystems). Peptides were loaded onto a homemade 75-μm inner diameter C18 HPLC column in solvent A (0.5% acetic acid in Milli-Q water) and eluted with a 70-minute linear gradient of 10% to 60% solvent B (80% acetonitrile, 0.5% acetic acid in Milli-Q water) at a flow rate of 250 nL/min. Each measurement cycle consisted of a full MS scan acquired in the Fourier transform–ion cyclotron resonance analyzer at a resolution of 100,000 and tandem mass spectrometry fragmentation of the five most-intense ions in the linear ion trap. Peak lists were generated using in-house developed software (DTASuperCharge) and searched against a decoy International Protein Index human database (version 3.13) using the Mascot search engine (Matrix Science) as described previously.52,53 Only peptides with a mass deviation <10 ppm were accepted, and at least two detected peptides were required for protein identification. Polyclonal antibodies against mature BMP1–1, BMP1–3, and the BMP1 prodomain were generated in rabbits immunized with specific synthetic peptides: BMP1–1 (amino acids 705 to 717; CRPALQPPRGRPHQ), BMP1–3 (amino acids 759 to 772; CTSPNWPDKYPSKKE), and the BMP1 prodomain (amino acids 97 to 108; CQSTNGQPQRGA). Peptide-specific antibodies were affinity purified (Multiple Peptide Systems) and their crossreactivity was tested using immunoblots with recombinant BMP1 and BMP1–3 protein (data not shown). The neutralizing effect of antibodies was demonstrated by the inability of BMP1–1 and BMP1–3 to process DMP-1 and procollagen I in vitro (data not shown). BMP6 and BMP7 were detected immunohistochemically as described previously.54,55 rhBMP1–3 and synthetic peptides from specific protein domains were used to immunize mice and produce hybridomas for the production of monoclonal BMP1–3 antibodies (Genera Reasearch Lab). The antibody crossreactivity has been characterized in Western immunoblots against BMP1 and BMP1–3 proteins (data not shown). Human BMP1–3 cDNA was synthesized from the human adult normal placenta total RNA using the SuperScript III First-Strand Synthesis System (Invitrogen). The BMP1–3 protein-coding sequence was amplified with the following forward (5′-GCAGATATCCTGGACTTGGCCGACTACACC-3′) and reverse (5′-CGATGCGGCCGCCTTCC-TGCTGTGGAGTGTGTCC-3′) primers using Platinum TaqDNA Polymerase High Fidelity. The gene-specific products were cloned into the pENTR221 plasmid and sequenced. To generate the pcDNA 3.2/V5-DEST expression clone, the sequence confirmed by pENTR221/BMP1–3 was recombined with the pcDNA 3.2/V5-DEST vector in an LR recombination reaction (Invitrogen Gateway Technology). The mammalian expression plasmid pSecTag2 Bmp1–3 was transfected into FreeStyle CHO cells using the FreeStyle MAX transfection reagent. The BMP1–3 expected molecular weight was 111 kDa, and the obtained protein molecular weight was approximately 95 kDa and did not contain the prodomain (approximately 16 kDa) (data not shown). The expressed BMP1–3 protein was >100 kDa and did not contain the prodomain. The protein was affinity purified via a BMP1–3-specific antibody column. In a parallel study, male Sprague–Dawley rats 2.5 months old were sham operated or 5/6 nephrectomized (n = 72) and divided into six groups and treated as follows: (1) sham, (2) CKD control, (3) CKD + 1 μg antibody, (4) CKD + 5 μg antibody, (5) CKD + 15 μg antibody, and (6) CKD + 5 μg BMP1–3. Rats were dosed with vehicle (30 mM Hepes buffer) or BMP1–3 antibody beginning with day 4, then on day 7, and thereafter weekly for 18 weeks (Figure 3). Staged time points of whole blood collection (by jugular vein while under isoflurane anesthesia) for serum and/or 24-hour urine collection (in metabolic cages) were performed throughout the study. Serum and urine markers of renal function were measured. The serum and urine method was measured by Jaffe method, alkaline picrate, kinetic with blank rate correction. The serum urea nitrogen (BUN) was measured by urease method with glutamate dehydrogenase and NADH. Urine total protein method was by dye binding with pyrogallol red-molybdate complex. Procedures on animals were approved and performed according to the International and Institutional Animal Research Committee guidelines. Plasma samples were activated and neutralized according to the manufacturer's protocol (R&D Systems, Inc). Samples were then diluted 1:60 in the calibrator diluents buffer supplied in the kit. Activated and diluted plasma samples were assayed as indicated by the manufacture's protocol. Plasma levels of BMP1–3 were measured using a newly developed ELISA with a specific monoclonal BMP1–3 antibody. Plasma samples were obtained from ten patients with CKD and healthy donors, as well as rats with CKD, as described previously. The kidney function in CKD patients was defined as a GFR of 20 to 65 ml/min per 1.73 m2 body surface area accompanied with albuminuria.60 Plasma samples (volume 5 ml) were purified by heparin affinity chromatography. Bound proteins were eluted and precipitated with saturated ammonium sulfate to the final concentration of 35%. The samples were kept on ice 10 minutes and centrifuged for 5 minutes at 12,000 × g. The supernatant was discarded and the pellet was dissolved in sterile water and applied to analysis. The human embryonic kidney cell line, HEK293, was purchased from ATCC. Cells were maintained in DME medium containing 10% FBS, 1% nonessential amino acids, and 600 μg/ml geneticin (Invitrogen) at 37°C in a humidified atmosphere of 5% carbon dioxide in air. After reaching confluence, cells were washed with PBS, lifted with 0.25% trypsin/2 mM EDTA (Invitrogen) for 5 minutes, and counted using 0.04% trypan blue. Cells were seeded in 24-well plates at a density of 5 × 104/ 0.5 ml/well and were allowed to attach overnight. They were treated in quadruplicate with rhBMP1–3 (150 ng/ml), BMP1–3 antibody (1 μg/ml), or a combination of rhBMP1–3 (150 ng/ml) and anti-β1-integrin subunit antibody (4 μg/ml) (R&D MAB17781). In addition, rhBMP1–3 (150 ng/ml) with anti-β7 integrin subunit antibody (4 μg/ml) was used as a control (Abcam, ab51813). Cells were pretreated with specific antibodies 1 hour before BMP1–3 treatment. After 4, 24, and 72 hours of treatment, the cells were rinsed twice with PBS and scraped in TRIzol reagent for RNA isolation. U2OS cells were obtained from ATCC and stably transfected with TOPFlash plasmid (Upstate), a TCF-luciferase reporter construct. Cells were maintained at 37°C, 5% carbon dioxide in McCoys 5A media and supplemented with 10% fetal calf serum, 1% Pen Strep, and 2 mM glutamine. U2OS TOPFlash cells were plated in regular growth media at a density of 10,000 cells per 96-well plate, incubated overnight, and treated with 3 μg/ml BMP1–3 protein ± 2 μg/ml BMP1–3 antibody, 25 μl per well Wnt3a ± 0.25 μg/ml recombinant human Dickkopf-related protein 1 in Optimem (Invitrogen). After an overnight incubation, cells were lysed with reporter lysis buffer (Promega) and luciferase expression was quantified using luciferase reagent (Promega). BMP1–3 protein was preincubated with BMP1–3 antibody for 20 minutes at room temperature before adding to the cells. C2C12-BRE-Luc cell line stably transfected with a reporter plasmid consisting of BRE from the Id-1 promoter fused to a luciferase reporter gene was provided courtesy of Gareth J. Inman (The Beatson Institute for Cancer Research, Glasgow, United Kingdom). Cells were plated at 2.5 × 104 cells/well in 48-well plates. After 24 hours, the medium was changed to serum-free medium for 7 hours.61 Cells were then treated for 17 hours in DME medium/F-12 with recombinant human BMP6 (5 ng/ml), BMP6 antibody (1 μg/ml), and BMP1–3 (1000 ng/ml);16 washed with chilled PBS (Invitrogen); and lysed in reporter lysis buffer (Promega). Luciferase activity was measured using the Promega luciferase assay reagent on a Victor Wallack luminometer. BMP1–3, BMP6, and BMP6 antibodies (Genera Research) were used in the assay. Total RNA was isolated from HEK293 cells at 24 and 72 hours using TRIzol (Invitrogen). cDNA was synthesized and amplified from 1 μg of total RNA using the Super Script III First-Strand Synthesis System (Invitrogen) as indicated by the manufacturer. Reactions were performed in a GeneAmp 4800 thermal cycler (PerkinElmer Life Sciences). Gene expression of interest was measured by using a LightCycler FastStart DNA Master SYBR Green kit in a LightCycler instrument (Roche Diagnostics), as described.62,63 The expression of four housekeeping genes was analyzed and geNorm software was used to identify the most suitable reference gene. Gapdh transcripts were used as a normalizer. Results are represented as a fold change of the comparative expression level. The list of primers used is shown in Table 2. All data are presented as mean ± SD. One-way ANOVA was performed to determine the effect of BMP1–3 and BMP1–3 antibody treatment efficacy on the kidney morphometric parameters. Statistical evaluation of the survival rate of rats with CKD was carried out by the Petö–Wilcoxon test. The results were considered significant when P was <0.05. David R. Healy, Amy L. Brault, and Vishwas M. Paralkar are employees of Pfizer. Slobodan Vukicevic received lecture fees from Merck and served as a paid member of the PEARL Scientific Advisory Committee for Pfizer. We thank Ivancica Bastalic for help in preparing the manuscript and Mirjana Marija Palcic and Durdica Car for providing animal care in rat studies. See related editorial, “Tolloid-like Proteinases Orchestrate Extracellular Matrix Formation,” on pages 588–589.